I absolutely love the Sofia The First series. It's super cute and adorable and not just for little girls to watch, but for boys too. Even though my kiddos don't watch the show as often as they use to, they are still glued to the TV when it's on the screen. What my daughter and I loved about The Floating Palace was that we got a chance to see one of our favorite Disney Princesses, Ariel, helping out Sofia. It was such a great adventure to watch and we loved that the DVD came with a few more episodes to watch as well. If you have yet to introduce your little one to Sofia The First, be sure to check out the latest DVD, The Floating Palace, as it will have your kiddos loving this new princess! Disclosure: All opinions are my own. 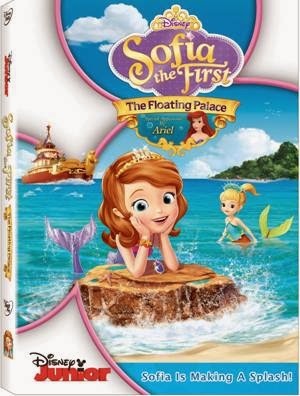 I received Sofia The First: The Floating Palace on DVD at no cost for the purpose of this review. No other compensation was received.